Bernardo Packable Walking Coat – I have a previous year's version of this coat and it's my fave. I can't believe it's on sale for less than $70; three colors to choose from. Kork-Ease Tall Ankle Boot – I saw this boot and thought it the perfect solution for those who love their cropped jeans but don't know how to wear them when it's cold. These are tall enough to tuck under and low enough of a heel for all-day comfort. But also, wear these with all sorts of leg widths and lengths of pants and jeans and even with dresses and skirts. Three colors to choose from, price varies by color but they're in general 40% off. Halogen x AP Soft Cable Sweater – A cable sweater is a wardrobe staple for me. It's classic, it's chic, and it's practical. This one is super soft, comes in five fab colors, and is on sale for less than $50. Halogen x AP Wrap Blouse – The perfect blouse for work with pants or under a suit, but also looks great on the weekend with jeans and some cool earrings. Four colors and prints to choose from and on sale for less than $50. 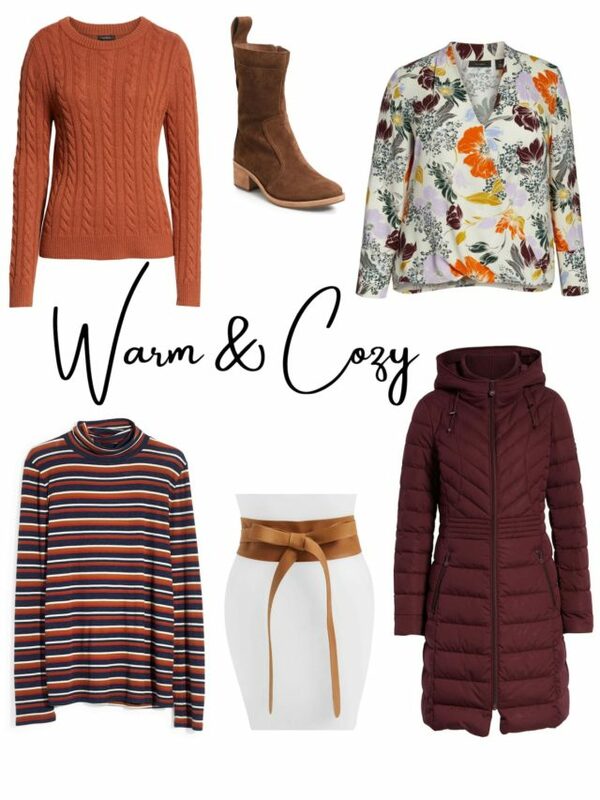 Madewell Striped Turtleneck – The perfect layering piece; this supersoft finely ribbed turtleneck would look great under sweaters, peeking out of blazers and denim jackets, and used to make spring pieces winter-friendly. On sale for less than $24. Leather Wrap Belt – I have this same belt from ADA Collection; you can see it in this blog post and this blog post and likely many many others. The quality is stellar, the color perfection. It gets softer and better with time and fits you whether you gain or lose weight (and does a great job of cinching too-big items and hiding weirdness in slightly small items). On sale for a hair over $55. Bombas No-Show Socks – Bombas are the bomb; they're great quality, hold up beautifully, are comfortable, and the company donates socks to homeless shelters when people make a purchase. At 40% off and a bunch of fun colors, this is a good time to stock up. FYI, this item is not in a collage. Bernardo Walker Coat – Another great coat from a brand I trust; this one has a hood, two colors to choose from, and on sale 30% off. Sam Edelman ‘Lior' Loafer – One of the top 20 best selling shoes in the past two years on Wardrobe Oxygen; a classic style, a not-too-warm leopard print that works with almost any color, and on sale for less than $100. Blondo Waterproof Knee-High Boot – Uber chic and classic, this boot works under midi skirts at the office and over jeans on the weekend. Three choices of colors and options of suede and leather. Classic style AND waterproof AND under $130! Nike ‘Cortez' Sneaker – If you're looking for a classic yet trendy sneaker that will look cool now and a year from now and won't appear too try-hard… these are it. White with a gold Nike swoosh, these are retro-cool but not ridiculous. Pair with faux leather leggings and a sweater now, with your t-shirt dresses and cropped jeans in the spring. On sale for a few pennies over $75. Nordstrom Wrap Front Cardigan – I own this cardigan, see it in this post. It's so great because it can hang long like a waterfall or be hooked up in a flattering ‘X' style. Five colors to choose from and less than $40. Halogen Long Sleeve Modal Blend Tee – I have this in the short-sleeved version from this past spring and I adore it. The silky drape is fantastic, so flattering. I can wear it with a cardigan and jeans on the weekend but it can also dress up enough to go under a blazer. It's lightweight so it makes for a perfect layering piece yet is still opaque. Six colors including two stripes and on sale for less than $25. Kate Spade Razzle Dazzle Studs – The perfect amount of sparkle to finish a dressy look or add some shine to Corporate America. They're the kind of earrings you'll reach for day after day. Two colors to choose from, on sale for less than $30. 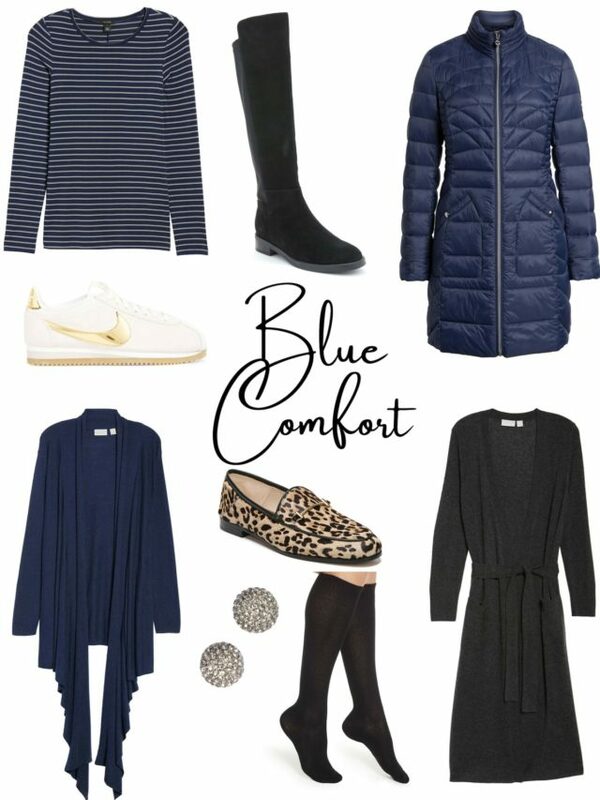 Cashmere Blend Knee-high Socks – I love these socks, they're perfect for extra warmth without bulk. They fit even under my skinny jeans without leaving a mark and keep their shape. Two colors and on sale for a hair over $20. Cashmere Robe – For YEARS I have desired a cashmere robe, but they are always so expensive! This one is on sale for less than $150! Two colors to choose from. Topshop Leather Biker Jacket – I have this jacket, you can see it in this blog post. It's really a great fit and quality for the price, and now it's on sale for $177. Regular and petite sizes available! Vagabond Metallic Bootie – My silver metallic booties were a splurge purchase I felt I didn't really need. Years later they are one of the oldest pairs of shoes in my closet and the little something that completes so many looks. I love them so much I'd grab them if there was a fire. These remind me of my boots and they're on sale for $112. 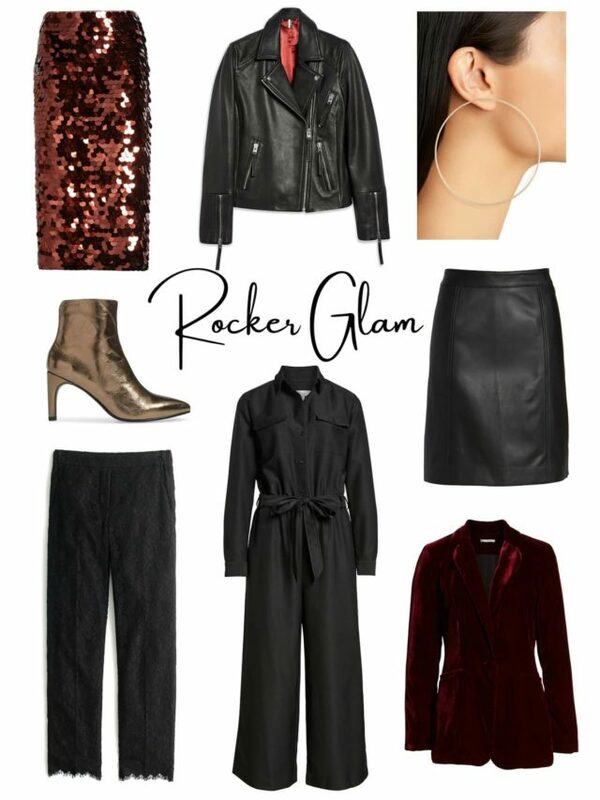 Halogen Velvet Blazer – Wear with a t-shirt and jeans for a night out, a silky blouse and tweed trousers to the office, dressy ankle pants and a cami for a cocktail party, use it as your topper with dresses. Two colors to choose from; this link is for the plus size option. Paillete Pencil Skirt – This is the kind of piece in your closet you won't wear regularly but will be glad you have. Style with a turtleneck, tights, and ankle booties for a holiday party, with a silk blouse and heels for a cocktail party, with a band t-shirt for a bachelorette… I could go on. It's on sale for less than $50 which is amazing. This is the link for the plus size, this is the link for regular and petite options. Two colors to choose from. Leather Skirt – The description says that this is a mini skirt, but based on the measurements I think this would be just at or above knee unless you are tall. It's so chic, so classic, the kind of piece that you can wear to the office with a silk blouse and pumps, a cashmere turtleneck with tights and boots, or with a blazer. On the weekend, pair with a cable-knit sweater and booties or a band tee and your denim jacket. All that style for less than $100 (and yes it's real leather!). J. Crew Lace Pants – Like the paillettes skirt, this is a piece that you'll not wear weekly but you'll be glad is in your closet. Style with a sequined or velvet tee and heels for a party, with a blazer and pointed toe flats for a networking happy hour, with a silk tee and fun earrings for a bridal luncheon, with a velvet blazer and sparkly jewelry for a cocktail party. Two colors to choose from and on sale for less than $60. 1901 Tie-Front Jumpsuit – I may or may not have placed an order for this jumpsuit… right now how chic would it be with a lightweight striped turtleneck and tall boots; come spring pair with flats and a pair of hoop earrings. Regular and petite sizes and half off! Jenny Bird ‘Boss' Hoops – These are not your traditional hoops; the front-facing design is super modern without being too over the top. A fantastic price for the quality at less than $60! Oh, that leather wrap belt is sold out! Bummer. I’m thinking today is the first time with the changes to the blog? I’m reading on an iPad and something is off—everything is stretched very widely across the entire page. Lots of great picks from the sale—thanks for sharing with us! Hi Lee, try closing your browser and the app for it. If you clear your cache it should show correctly. Thanks for bringing it to my attention! Hi again—thank you! The site looks great! Thanks for helping me out.